I have finally buckled and I am now starting a full blog over at lillyringlet.com where I will bring everything under one roof. This means that all my cooking, sewing, gaming, social media and design related posts will all be there from now on. Since blogging, I have been tossing and turning whether or not to do this but as I get more into writing blogs, I really want to make it easier and have it all in one place. Thank you for everyone who has followed me here over the last few years and I hope to see you soon at my website! After watching old episodes of Great British Bake off and being obsessed with Tea, I was really inspired to my scones while recovering from the flu at the weekend! Before you worry about me making others sick, I was getting over it and ate most of them… well 7 of the 9 I made…. I love scones as a treat as you can add as much (or in my case) little cream and jam as you want. For super tasters desserts can sometimes be a bit of a problem with such rich sweet flavours. I love food, especially desserts, where I have control over how rich it is. If you are looking for a treat for a super taster, this is perfect! The great thing about this recipe, not only is it quick and simple but it also is just made of ingredients that you generally have around the house anyway! For my first batch of scones that I have made, they came out really well and I can’t wait to make more again very soon. You can also add lemon and chopped ginger, but as a supertaster (and through being lazy) I didn’t. Remember you will also need whatever it is that you want to include in your scone once finished. I went for the traditional clotted cream and jam coz you sometimes can’t beat the classics. 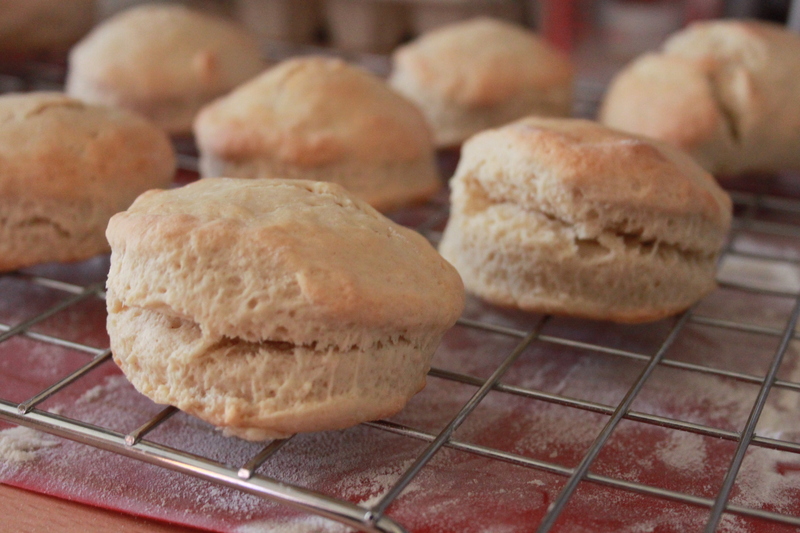 So how do you make these nice and simple scone you ask? First the basics, pre-heat the oven to 200 degrees or gas mark 6 and get everything cleaned up and ready. Lucky this is a great recipe that you don’t need any mixing equipment other than a butter knife, decent sized bowl, scales and baking tray! 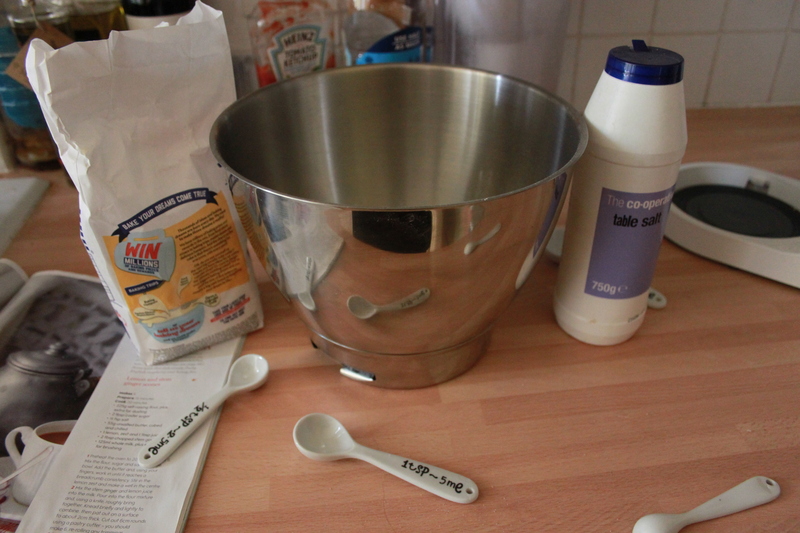 I also used a small glass cup to cut out the mix so it is a really handy recipe to do with kids. Now I am lucky as I do have cute measuring spoons and if you are going to cook regularly I highly recommend them. Unlike trying to using normal spoons and trying to work out how heaped or unheaped you want it, these are designed so that you can get an exact same amount every time! Now you are ready put the flour, sugar and salt into the bowl. Then chop up the butter into small cubes. The smaller the better as this will make the next bit a lot easier! Put the butter into the bowl, but try to spread it out otherwise it tries to stick to its self rather than mix in with the other stuff in there. Now is the fun (but messy part), you need to work in the butter to the mixture. 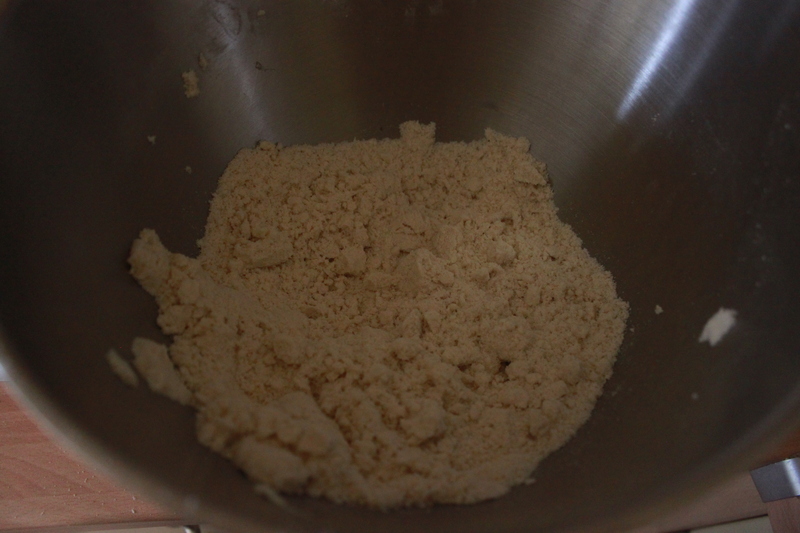 This basically means that you try to squish and smoosh the all the mixture together so that the butter and mixed into the flour, sugar and salt until it all is a breadcrumb consistency. Really make sure that you get the butter throughout the whole mixture and keep going until you are really sure that the butter is throughout the mixture. Now this is the part where if you want to add lemon and ginger, this is when you add 2 tbsp of chopped ginger and 1 tbsp of lemon juice to the 125ml of milk, otherwise just pour in the milk to the breadcumb like mixture. Now the next bit may sound werid but rather than using your finger, a mixer or other normal mixing utensils, you actually use a plain old butter knife to roughly mix everything together. This means that you get a really rough mixture that you associate with scones. Mix it up too much and it will be more like cake. Now you need to knead the mix briefly (again remember that too much pounding and you won’t get that scone texture we are looking for). Using your hands, pat flat the mixture till it is about 2cm thick. Remember if you are pat it too thin you won’t get good height on your scone. It is quite deceiving so don’t make it too flat! Patting it flat gives it that nice top texture and makes it harder to make it too flat. I used a small glass to cut out the scones (in fact I used an old nutella glass) but you can use other cutters. You should get about 6 scones, however you will need to roll together the leftovers to make the final scone. If you pat the mixture too thin, you will find you get more than 6. Now is time to take those cut out scones and put them on a baking tray lightly dusted with flour. Lightly brush the scones with milk. You can do this with clean fingers or with a pastry brush. Now it is time to put your scones in the oven for 18-20 minutes until nice and golden. Let them cool and then gobble up with clotted cream and jam! These are quick and simple scones that will be sure to please most people. Because of the nice simple texture and taste, even super tasters will love this as they will be able to add as much or little filling as possible. Mine came out really well but I would love to hear how yours came out! Will you be adding any additional flavours or ingredient? Or any tips that you have that you found when making yours? Now the famous debate… do you put clotted cream or jam on your scones first? Three years ago I met my wonderful other half who introduced me to making food from scratch. Previously food was difficult to explore for me as everything tastes so potent or rubbish as a super taster. By making everything from scratch, I am able to experiment and find out what it is that I do and don’t like, as well as why! Bread has always been a favourite food of mine because as super taster it can really be incredibly delicious and different. When my mum first found out that I was a super taster, she helped me start to love food by exploring different bread. Now that she understood that I could taste all the little differences, we started to experiment with different bread. 10 years on I made bread from scratch with BF shortly after we started dating and now I make it regularly. Through experimenting I know have a bread recipe that everyone loves more than any other bread they have tried. The other day I was given bread by a specialist food store when they found out I was a super taster and I was going home to make bread. They believed that I would love their bread so much that I would come back and purchase more. What they did not account for was just how good my bread is. 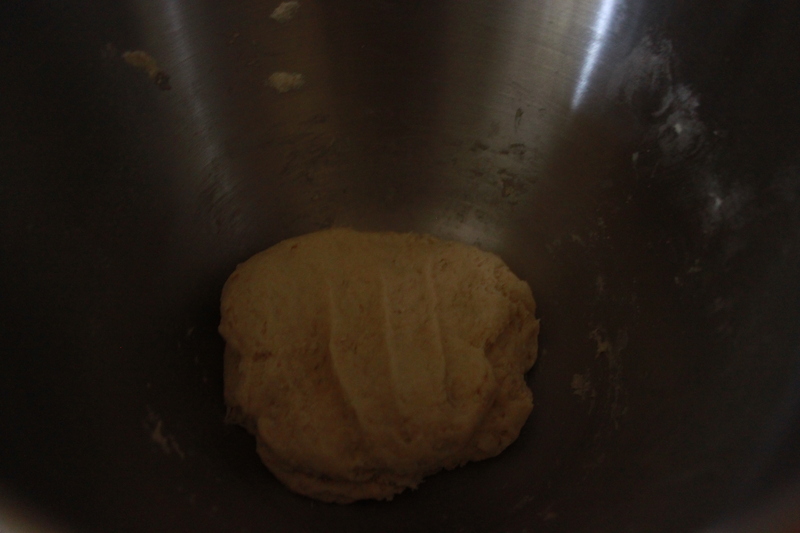 Measure out 500 grams of bread flour. I like to use Allisons Strong White Bread Flour, or Waitrose Strong White Bread Flour. Put it into the mixing bowl. Now I have Kenwood Chef with a bread hook, which I would highly recommend getting. Bread hooks are a must if you plan to make bread regularly. Measure out 2 Tsp of quick acting yeast. I use Dove Farms Quick Yeast. Add 1/4-1/2 tsp of salt to the mix. Start slowly mixing the flour, salt and yeast together. I put my Kenwood to under 1 while I prepare the water mixture. In a measuring jug, add 200ml of filtered water, 1 tsp of caster sugar, 100ml of boiling water and a splash of olive oil (I personnaly like to use Jamie Oliver Olive Oil). 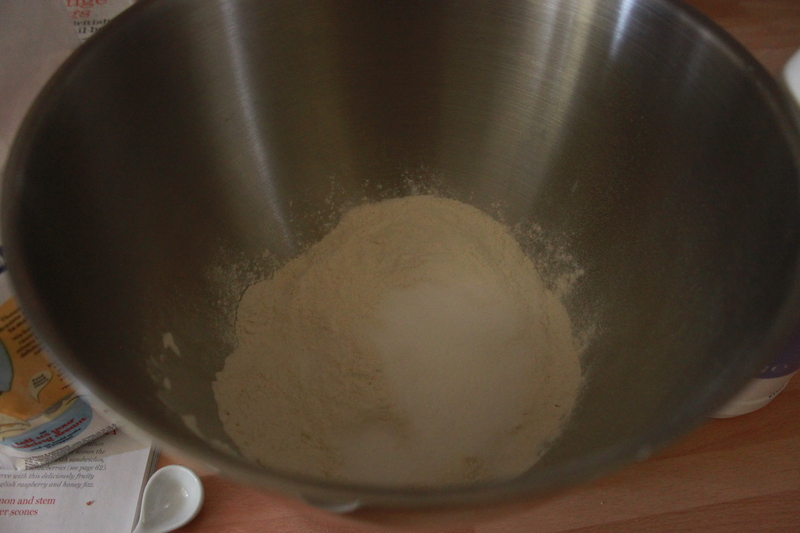 Mix together and then very slowly add to the flour mix as it continues to mix together. Once all the liquid has been added I turn up to 1. After 10 minutes of mixing, I remove the bread hook. Check however that the mix is together in a ball of dough. Put a wet cloth over the bowl and leave for an hour. Turn the oven on to 190 degrees. 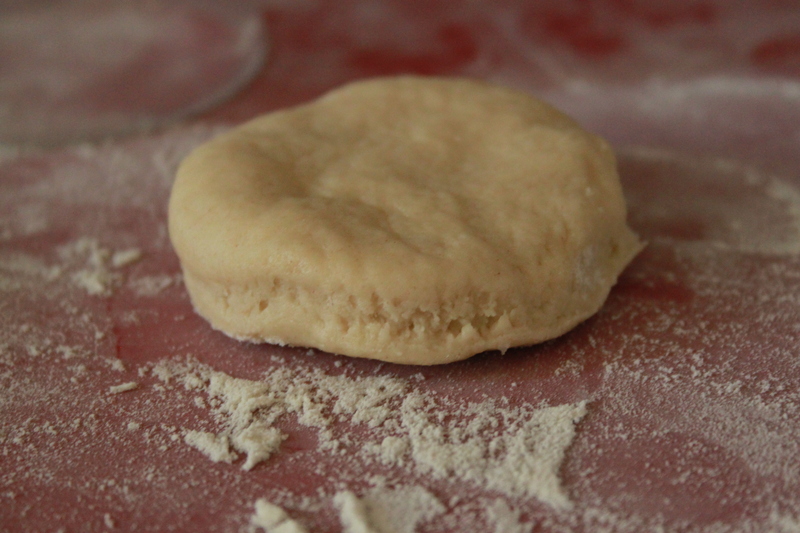 Prepare a floury side for you to manage the dough. I personally use a silicon mat and put flour on top. This allows for me to quickly clean and use the side for other purposes. This is really useful when you have limited space in the kitchen. 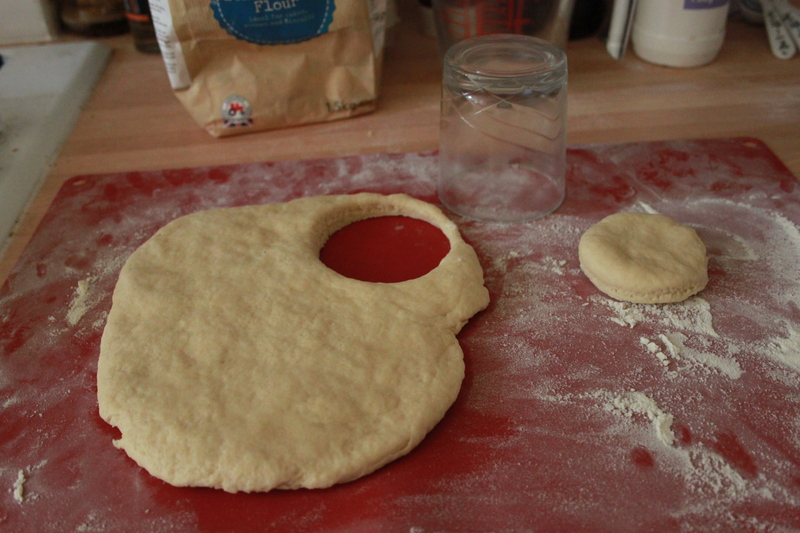 I cover my hands in dough before pulling all the dough out and putting on my flour mat. 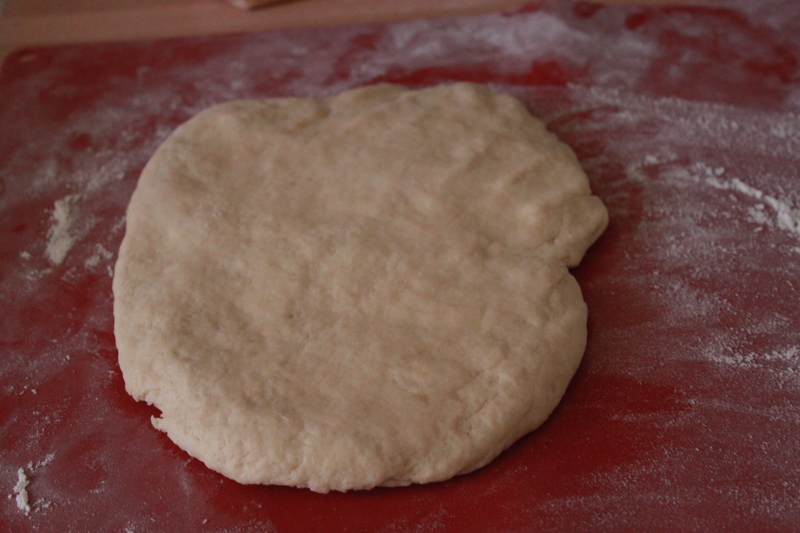 Fold the dough repeatedly for 5 minutes. I do this by flattening the dough, folding in half and repeating. 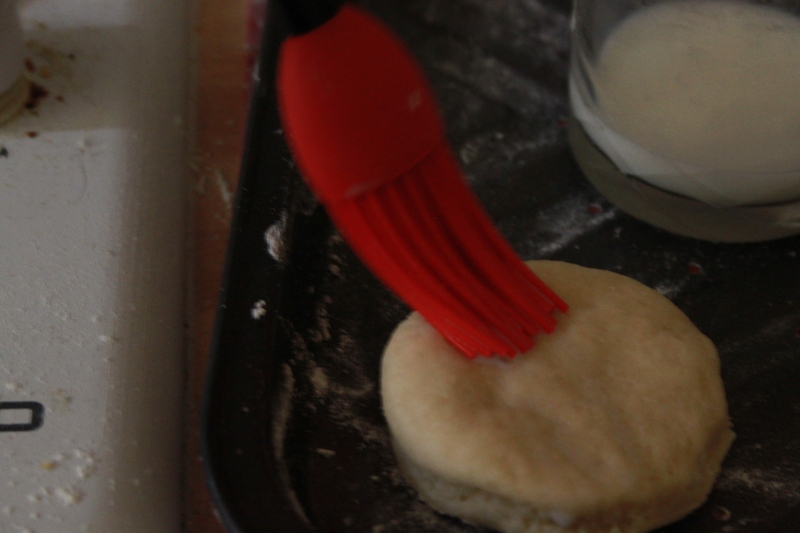 Keep regularly re flouring the side/mat and hands to keep dough from sticking everywhere. Now I roll the pieces into a ball before placing over my thumb to create a deep dip, and pulling the dough together over the now hole formed. I have found that this reduces the likelihood of big air bubbles (ironically) forming and gives an interesting bottom to the bread. Leave for 10 minutes (for me usually until the oven has warmed up enough). This will allow the bred to rise further and grow before going back in the oven. My biggest tip with bread is experimenting. You might find that you like your bread differently than me. I know that BF loves his with 1/2 a tsp of salt compared to me who prefers it with only 1/4 tsp of salt! What are your biggest tips in making bread? What is your favourite type of bread?